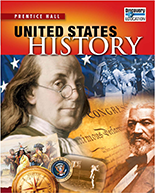 (High School) Prentice Hall United States History allows students to discover the enduring issues in American history. Students investigate important American issues, analyze a variety of perspectives and form their own answers to the enduring questions that have shaped out world. 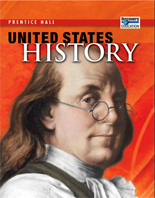 Every element—from the stunning visuals to the interactive features—allows all students to understand and connect with history. Writing, reading, and vocabulary, primary sources and document based assessment, and note-taking instruction encourage students to think critically and thoughtfully.